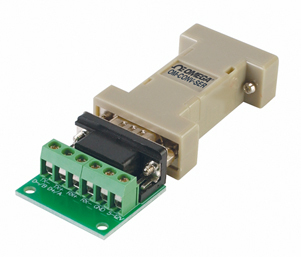 The OM-CONV-SER is an RS-485 half-duplex to RS-232 converter. It is powered from the computer’s serial (COM) port so no external power is required. This unit is small in size, has a long transmission distance, can handle high data rates, is very stable in performance and connects to a standard DB9 serial (COM) port. The converter can be used in a wide range of applications including industrial automatic control and measuring systems and PLC applications.